Do you ever get some time in a month or a week just by yourself and no one else? No kids, no family, no hubby, etc etc? I do. Not saying that I don’t get my space with hubby dear around. He is my biggest supporter in whatever I want to do in life. But there are times we women need to be alone, with no one around. I get those days at least twice a month when hubby attends his medical meetings in the evening. For that evening I am free to cook what I like, which usually means something that he does not like and to watch any program or movie that I want. No one to tell me that candy crush is a kiddie’s game, no one to tell me that I am taking too long to solve the sudoku or no one to tell me that I only buy the newspaper for the crossword! For those 3-4 hours, I am doing what I want. It’s a great relaxing feeling. But when he gets home, I am happy not to be alone. When I tell him that, he thinks I am crazy, wanting time by myself and at the same time glad that he is at home. But that’s us women. He gets his space when I am away attending my Lions meetings! However, I still have to prepare dinner for him. But he gets to watch his action packed movies or absolutely silly supposedly scary movies. 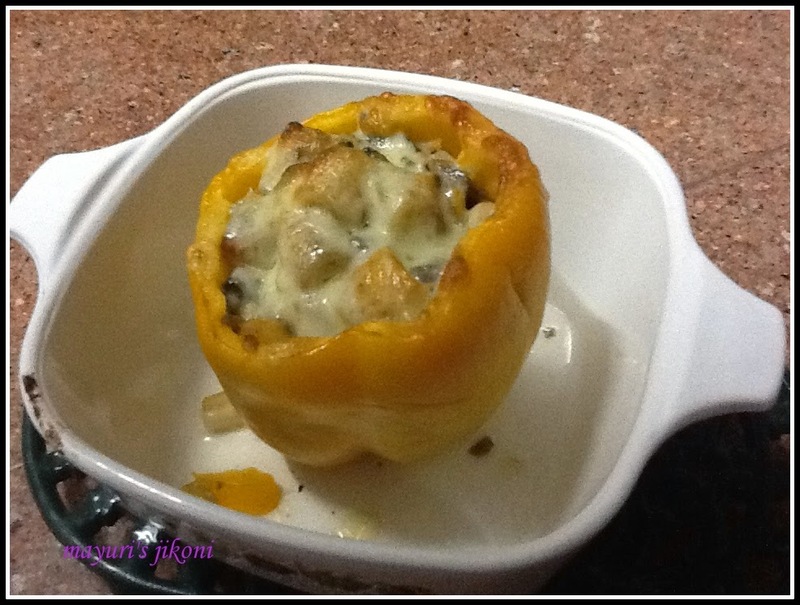 So a few days ago when he had to go off for the meeting I made stuffed pepper for myself. Hubby doesn’t like eating peppers as he things it upsets his tummy. I, on the other hand love peppers. I tried to make this just enough for one, but landed up with a filling enough for two. Slice the top of the peppers. Remove the stem and chop the remaining top part of the pepper. Remove the seeds and the white part of the pepper with a sharp knife. Cook the pasta in salted water till done. Drain out the water. Add onion and garlic and stir fry it till its a bit soft. Add the chopped pepper, mushrooms and cook for 2-3 minutes. Take the pan off the heat. Add corn, olives, salt, pepper, pasta and the tomato puree. Stuff the peppers with the filling. Place them in a deep oven tray or oven proof casserole. Add about 2-3 tbsp of water to the casserole from the side. Place it in the oven and let the peppers cook for 25 -30 minutes. Remove the dish from the oven, open up the foil. Sprinkle the grated cheese over and place the dish back into the oven. Let it cook for 5 minutes more or till the cheese has melted. Serve immediately as a side dish or a light meal. Adding a little water helps to create steam. The steam cooks the pepper nicely without it pepper drying up. Looks too good, makes my mouth water..